Back in the 1950s, in a ploy to lure audiences away from their televisions and back to movie theaters, a filmmaking pioneer named Fred Waller developed a unique theatrical format called Cinerama that involved photographing a movie with three cameras simultaneously and projecting it back (via three synchronized projectors) onto a huge curved screen. Sadly, the cost and complexity of shooting and displaying movies in this manner eventually gave way to the (less enveloping but much more practical) single-camera widescreen formats that we know today. However, with similar motives in mind, a South Korean theater chain has revived the basic concept of Cinerama for the digital age with some new twists of its own, in a new format called ScreenX. Whether this will catch on outside of Korea remains to be seen. In its day, Cinerama was enormously popular for a time. In fact, the first film in the format, ‘This Is Cinerama‘, was the highest grossing movie of 1952 despite only playing in a single theater that whole year. A Cinerama feature wasn’t just a movie. It was a cultural event. The majority of Cinerama productions were travelogue documentaries, but two Hollywood narrative films (the more famous being ‘How the West Was Won‘) were also made in the format. By the early 1960s, Cinerama struggled to compete with less expensive formats and compromised on its technical specifications by introducing cheaper single-camera variants that couldn’t match the quality of the original three-strip process. Aside from a small handful of specialty revival theaters (including the Cinerama Dome in Hollywood), Cinerama is basically defunct today. But here comes ScreenX to take on the legacy. 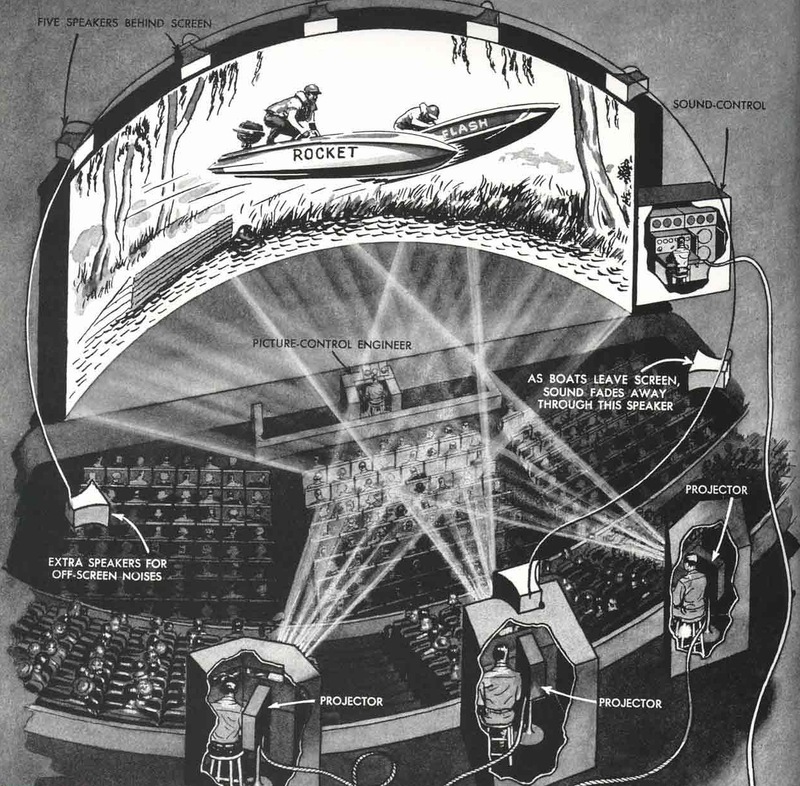 Although similarly photographed with three camera lenses and displayed with three projectors, ScreenX isn’t exactly the same as the original Cinerama. 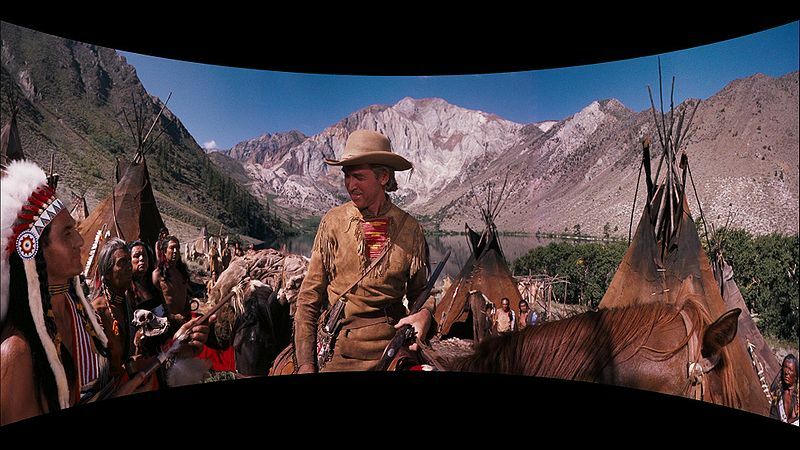 For example, Cinerama movies were projected onto a large 146º curved screen. While the technology of the day unavoidably contained “join lines” that marked the boundaries of each camera view, the intent was to create a single continuous image. ScreenX is a little different in design. A ScreenX theater provides a 270º view with a normal flat screen in the front of the theater where the majority of important action will take place, plus additional imagery projected onto the side walls at a sharp perpendicular angle. The side walls don’t actually have screens on them. They’re painted dark gray, and images may be shone onto the surround speakers or soundproofing material. Nevertheless, the basic intent is similar, in that the movie is meant to envelop the audience’s peripheral vision. At first glance, this may seem like a gimmick more suited to a theme park attraction than a narrative film. However, the GCV theater chain sees it being like IMAX, a high-end venue where all sorts of movies can be played, some of which may be produced to fully take advantage of its features. As proof of concept, one of the first ScreenX attractions is a half-hour action film called ‘The X’, directed by Kim Jee-woon (‘I Saw the Devil’, ‘The Last Stand’). At present, GCV has 40 ScreenX cinemas in South Korea, with plans to produce a feature-length film and expand into the Hong Kong and possibly U.S. markets. I’m sure Cinerama is an amazing experience, but the format had some serious problems that went beyond the cost and impracticality of filming. Its use of zoom when filming deforms the picture, so that items closer to the camera look much too big. This screenshot illustrates it. The indians placed behind the fur trader look like dwarfs. Here is another example. The girl standing behind the girl in the foreground looks like a small child despite being the same distance from her as the man in the foreground. Your screenshots are from smile-vision blu-ray transfers (plus you linked to the one website we are not allowed to link to in this forum). You are judging something that is meant to be played on a curved screen that has had the picture altered to look halfway decent on a flat screen. Shoot, by that logic, I could say that IMAX is a horrible format because stuff that was meant to be shown on a Dome (pretty much every NASA film in IMAX) looks horrible and distorted on home video transfers. The arugument fails to hold up. Worse, the sides are not being projected on a screen – they are being projected on the wall – over the speakers and lights. Then the fact that they are not using a curved screen but are rather using perspective means that, unless you are sitting at the back of the audtitorium, the immersion is just will not achieve the desired effect.